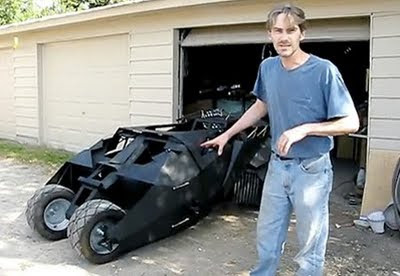 Eternity on a Rock: Batman wannabe builds his own Batmobile! A go-kart enthusiast and Batman wannabe (both the same person) built this amazing lookalike Batmobile replica of the one shown in the recent 2 Batman movies, namely Batman Begins and The Dark Knight. It looks almost like the real thing, perhaps not to the actual scale of the original used in the movie. After which, he decided to put it on sale in Ebay. It closed with a total of 2 bids of at a selling price of US$30.88. Not too sure if it was actually sold for that price though.. It's gonna look cool though, to zip around your local park in this machine!